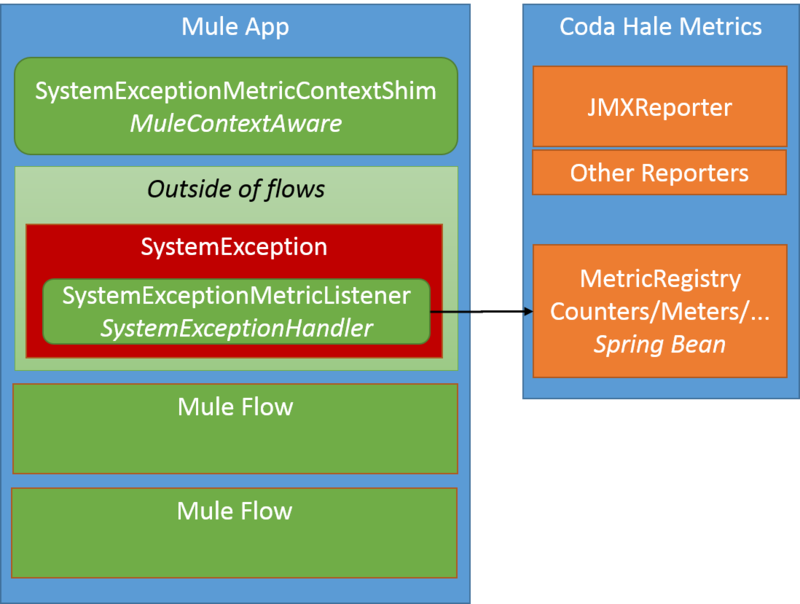 This article describes how to use the Coda Hale metrics library to capture the counts and types of system exceptions thrown outside of Mule ESB flow processing. Historical exception information is exposed via JMX or written to disk using CodaHale reporters as described on the CodaHale metrics web site. You can use this same technique in any Java application. We inject instrumentation at the system context level. That component converts the wrapped exception stack to a counter name that is then created and incremented in the Coda Hale registry. I use the simple running counter because I don't find the native Coda Hale histogram data useful for this type of metric. You can use other metric types if you want more complex statistics. MetricsRegistry: A CodaHale singleton that maintains a reference to all statistics. It is injected into other components. JMXReporter: A CodaHale reporter that exposes the MetricsRegistry via JMX. Instantiated by MetricAgent. Codahale supports other reporters in place of or in addition to the JMXReporter. We use the same initialization configuration we used in the flow exception metrics example. Instantiate the JMXReporter using a custom Mule Agent that is injected with the MetricsRegistry spring bean. Create SystemExceptionMetricContextShim, a MuleContextAware component in spring that will get called by Mule when initializes the context. This Shim injects the SystemExceptionMetricListener which actually counts all the exceptions. Create a exception listener spring bean as a singleton that we inject into the Shim. This listener is set into the MuleContext by the shim. You can find an example program on github at https://github.com/freemansoft/Mule-demo. 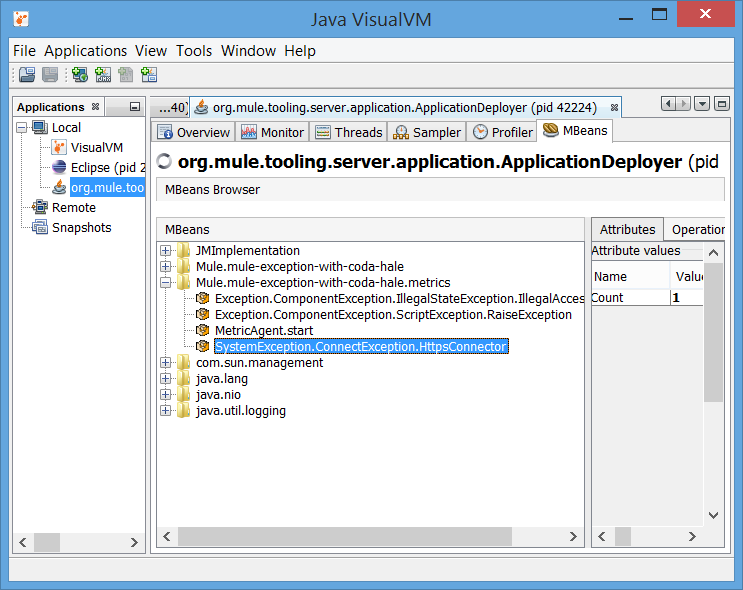 It is a Mule maven project originally built with Mule ESB 3.5.2. This is the same demo used in the flow exception metrics example. Th demo has a mis-configured HTTPS endpoint/connector that throws an System exception at deployment time. 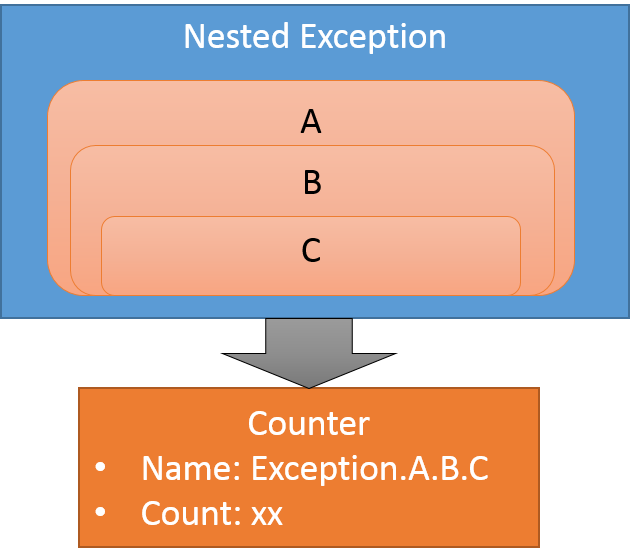 The following image displays the value for ConnectionExcepton raised in the HttpsConnector. We get one exception for the endpoint on startup because of a configuration error. You could see higher numbers for connectors whose remote connections go up and down. Teams can build production support, problem triage and troubleshooting aids into their applications by integrating Coda Hale metrics and Mule's exception handling strategies. These metrics can be exposed via files , JMX beans or other tooling to make them visible in a variety of environments.